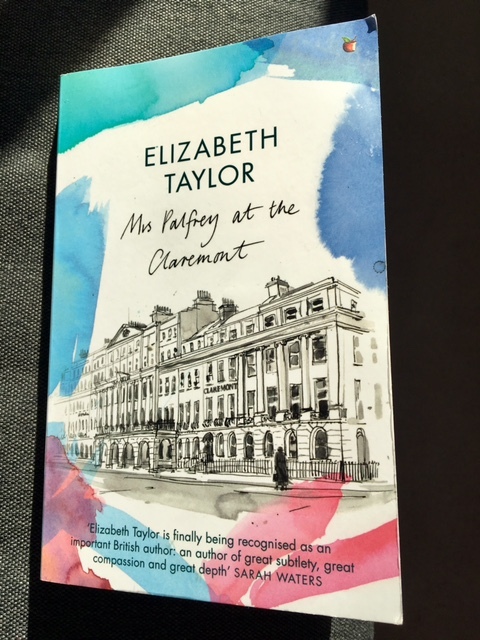 This entry was posted in English Literature, Uncategorized and tagged Elizabeth Taylor, Mrs Palfrey at the Claremont, Virago Modern Classics, WB Yeats by Simon Lavery. Bookmark the permalink. Taylor was brilliant at capturing those little moments of life that more expansive authors might have missed. This was a powerful book, and you’re right – there’s much less about the ageing of women in literature and Taylor doesn’t mince her words at all. It’s one of the most moving novels I’ve read in a while, Karen. I shall move on to more by her. A very thoughtful review, Simon. I think this is my favourite of the 4 Taylors I’ve read to date, although The Soul of Kindness (which I reviewed back in January) has given it a run for its money. You’re right to mention the humour; I think it’s the delicate balance between darkness and light that makes this novel so tender and appealing in spite of the melancholy subject matter. Taylor has an unflinching gaze which I always enjoy. Probably still my favourite of her novels, and therefore always a pleasure to read a new review. I have had Angel on my shelves for years, no idea why I’ve never read it. And having read so many wonderful reviews of her books since discovering the world of book blogs, I snapped up Mrs Palfrey when I noticed it late last year. A sombre theme to this book perhaps, and one we all face when we come to think of our own ageing, but the gallows humour must lift it, I suspect – and place it very firmly into a certain niche. I look forward to reading it. Another insightful review – thank you! ET is brilliant in showing the privileged classes being rude, condescending or haughty- just one aspect of her incisive humour. Angel is on my list too. Thanks for the kind words, Sandra. Thank you for this perceptive and intelligent review. I think that Taylor’s book is among the first novels to focus on an elderly protagonist, a community of last-resort, and the burial plot instead of the marriage plot. See also Spark’s _Memento Mori_ and _Ending Up_ by Amis. Taylor’s is the best in giving us a privileged view of one person–the others have a broader focus. Taylor’s is the most successful, compelling, and moving to my mind. Having not yet read Mrs Palfrey, I may be wide of the mark here. But in terms of an elderly female protagonist and written some 40 years earlier, I would add All Passion Spent (1931) by Vita Sackville-West. Recently widowed, it is assumed that Lady Slane will live out her declining years sheltering in turn under the roofs of her various children. She herself has other ideas. It’s some time since I read All Passion Spent – it didn’t occur to me until I read your comment, Natalie, that it might make a useful comparison to Mrs Palfrey. Now of course, I want to read both of them! Sandra: I haven’t read the VSW novel you mention, but from what I’ve read in reviews and blogs I’m sure you’re right. Interestingly, one of the monstrously rude characters who pops up in Mrs P is the obnoxious Lady SWAYNE – (think i called her Slayne in an earlier reply to a comment) – whose name is surprisingly similar to Slane. While on the topic of novels about older protagonists, Caroline Lodge’s blog Book Word (link in my post) specialises in this kind of novel; I think the later works by Americans like Philip Roth and John Updike could be useful additions to this group; James Salter’s last novel (I posted about it a while back) isn’t really about an elderly man, but was written in his 80s. I daresay Anita Brookner works this territory too. Simon, thank you for this; I shall check out those links. And yes, Brookner of course. You sent me off to my goodreads list to remind myself which of her books I read that came to mind as fitting in this genre: The Next Big Thing is the one I had in mind. Rather surprisingly though, I had to look through each of her novels that I’ve read – maybe 5 or 6, about 10 years or so back – and beyond Hotel du Lac, I recognised none of the storylines. I won’t speculate on what this tells me about my dalliance with Brookner, but it did surprise me! Sandra: typically for me, I haven’t read more than a couple of Brookner’s novels. I suppose I just pick these things up as I bumble along – i.e. I know she tends to write about women of a certain age, engaged in late-life or mid-life contretemps/crises/epiphanies. Many years since I read her, I admit. Doesn’t stop me pontificating…Thanks for all your interest in this topic. Makes posting these pieces worth while, to think someone out there is taking note, reflecting. Simon, I am coming across as a great deal better read than I am! I also bumble along – with huge gaps in my reading experiences, but that can be said for many of us. I do like making connections between books though, and this thread has given me plenty to think about. Thank you! Very nice Simon. I like your analysis of that description of the rain and the placing of “slithering”. I think you’re right too to really focus in on that night we spent with Mrs Arbuthnot. She’s almost the villain of the piece, and yet she’s the first to show any kindness to Mrs Palfrey (which Mrs Palfrey never forgets) and Taylor never loses sight of her humanity. It’s just a tremendous novel. You bring it very much back to mind. On a different note, Patrick Hamilton’s The Slaves of Solitude is another boarding house novel with a bully as a central character, but far less forgivable than poor Mrs Arbuthnot to whom ultimately I think we have to extend our sympathy. It’s a very different book but if you’ve not read it you might like it (not that I can remotely say why one reminded me of the other, save that both feature boarding houses and social rather than physical bullies). Anyway, if you’ve not already read it there’s a review at mine. Re novels with elderly protagonists, from the comments you’re evidently much better read than I am on that score so I’m more noting your suggestions than having any of my own. That’s a key feature for me, Max: that generosity of spirit. Even a nasty bully is understandable. I’ve not read P Hamilton though have long been aware of him. Yet another to check out!